Notre Dame has landed its top target at receiver in the 2020 class as DeSmet (Mo.) 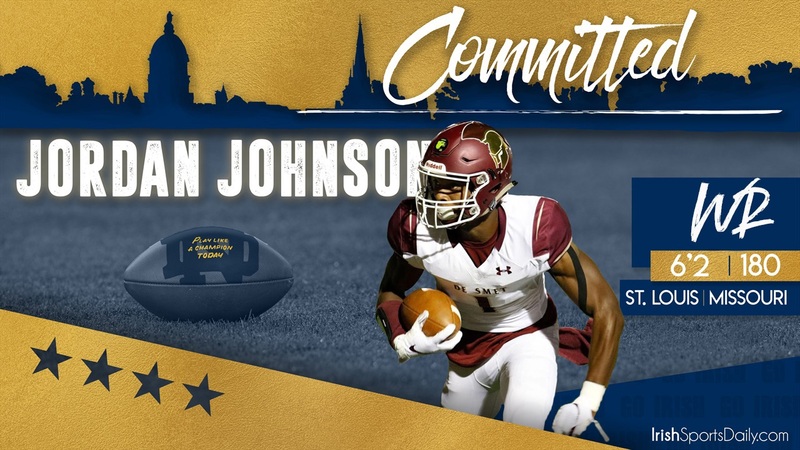 receiver Jordan Johnson‍ has committed to the Irish. “I would like to thank the man above for blessing me with the talents and blessing that I have today. I would like to thank all the coaches that have been in my life and developed me to be the player I am today. I wanna thank my parents for everything that they have done for me and couldn’t be more thankful for the people that I have in my life. Thank you to all my teammates that’s hanging with me through this process. Thank you to all my guys that stick with me through anything. The four-star prospect has always had Notre Dame high on his list, but offensive coordinator Chip Long and receivers coach Del Alexander showed Johnson how they would use him in the offense and it was hard to turn down. The St. Louis native is also the ultimate competitor as his head coach Robert Steeples told IrishSportsDaily earlier this year. “Jordan enjoys the lights and the big moments,” said Steeples. “He welcomes competition on his level, but he also doesn’t play down to people who aren’t. Johnson chose the Irish over Alabama, Arkansas, Auburn, Florida, Iowa, Kentucky, Michigan, Minnesota, Mississippi State, Missouri, Nebraska, Ohio State, Oregon, Penn State, Purdue, Texas and Wisconsin to name a few.